BPEmb is a collection of pre-trained subword embeddings in 275 languages, based on Byte-Pair Encoding (BPE) and trained on Wikipedia. Its intended use is as input for neural models in natural language processing. Subwords allow guessing the meaning of unknown / out-of-vocabulary words. E.g., the suffix -shire in Melfordshire indicates a location. Byte-Pair Encoding gives a subword segmentation that is often good enough, without requiring tokenization or morphological analysis. In this case the BPE segmentation might be something like melf ord shire. Pre-trained byte-pair embeddings work surprisingly well, while requiring no tokenization and being much smaller than alternatives: an 11 MB BPEmb English model matches the results of the 6 GB FastText model in our evaluation. >>> bpemb_zh.encode("这是一个中文句子") # "This is a Chinese sentence." What are subword embeddings and why should I use them? If you are using word embeddings like word2vec or GloVe, you have probably encountered out-of-vocabulary words, i.e., words for which no embedding exists. A makeshift solution is to replace such words with an <unk> token and train a generic embedding representing such unknown words. Subword approaches try to solve the unknown word problem differently, by assuming that you can reconstruct a word's meaning from its parts. For example, the suffix -shire lets you guess that Melfordshire is probably a location, or the suffix -osis that Myxomatosis might be a sickness. There are many ways of splitting a word into subwords. A simple method is to split into characters and then learn to transform this character sequence into a vector representation by feeding it to a convolutional neural network (CNN) or a recurrent neural network (RNN), usually a long-short term memory (LSTM). This vector representation can then be used like a word embedding. Another, more linguistically motivated way is a morphological analysis, but this requires tools and training data which might not be available for your language and domain of interest. Enter Byte-Pair Encoding (BPE) [Sennrich et al, 2016], an unsupervised subword segmentation method. BPE starts with a sequence of symbols, for example characters, and iteratively merges the most frequent symbol pair into a new symbol. For example, applying BPE to English might first merge the characters h and e into a new symbol he, then t and h into th, then t and he into the, and so on. Learning these merge operations from a large corpus (e.g. all Wikipedia articles in a given language) often yields reasonable subword segementations. For example, a BPE model trained on English Wikipedia splits melfordshire into mel, ford, and shire. The most similar BPE symbols include many English location suffixes like bury (e.g. Salisbury), ford (Stratford), bridge (Cambridge), or ington (Islington). Which vocabulary size should I pick? The advantage of having few operations is that this results in a smaller vocabulary of symbols. You need less data to learn representations (embeddings) of these symbols. The disadvantage is that you need data to learn how to compose those symbols into meaningful units (e.g. words). The advantage of having many operations is that many frequent words get their own symbols, so you don't have to learn how what the word railway means by composing it from the symbols r, ail, and way. The disadvantage is that you need more data to train good embeddings for these longer symbols, which is available for high-resource languages like English, but less so for low-resource languages like Khmer. Embeddings and SentencePiece models will be downloaded automatically the first time you use them. Alternatively, you can download pretrained embeddings and SentencePiece models on the download page of the language of your choice. 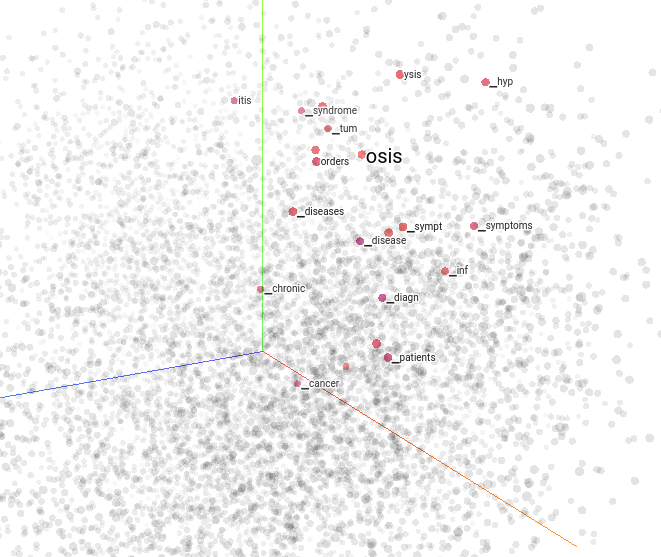 The download page also contains various visualizations, a link to view the embeddings in the TensorFlow projector, and a sample of the Wikipedia edition used for training. You can explore UMAP projections of the embedding space like the one below on each language's download page. You also can load the embeddings into the TensorFlow projector. Benjamin Heinzerling and Michael Strube, 2018: BPEmb: Tokenization-free Pre-trained Subword Embeddings in 275 Languages.